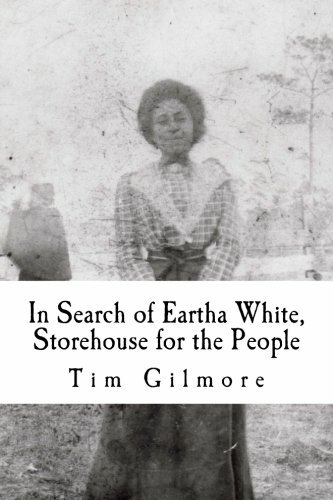 Before I ever met TIM GILMORE, I met his writing. I was a teenager, eager to explore the dozens of overgrown abandoned sites strewn throughout my hometown of Jacksonville, FL. I was still cautious, though, and did what any millennial would do before entering a sketchy building—I Googled it. That’s how I found Jax Psycho Geo, a blog Tim keeps to document his exploration of mysterious places in Jacksonville. Tim’s website not only gave me courage to explore, but introduced me to some of my favorite pieces of creative nonfiction. 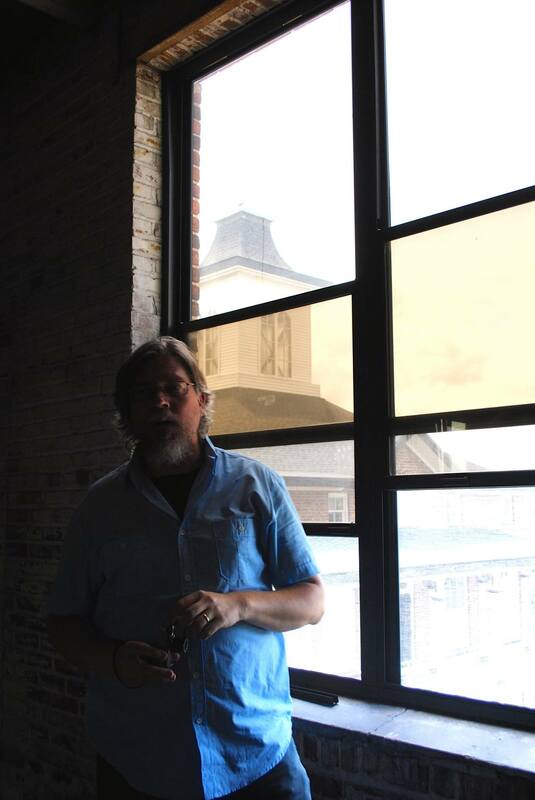 I interviewed Tim in the lobby of Sun-Ray Cinema, an independent movie theater in the Five Points area of Jacksonville. We could hear the screams of The Nightmare on Elm Street emanating from the crack in the theater’s doors. HW: When you’re writing about something historic, does that take place at the same time as something that’s happening today? TG: I write mostly about historic stuff. I always center it in place. I look at the place as it is now. That inevitably means that I’m looking at what has happened here, and infuse the identity of that particular place. You can’t go back in time, so even when you’re talking about the past, it’s present. I always see it through place rather than time. At this point in our interview, The Nightmare on Elm Street seems to have reached the peak of its rising action. Its screams are loud and throaty. TG: It’s going to be great if you can hear this screaming in the background of the tape. HW: (laughs) I’m looking forward to it. I put your blog-writing and your book-writing into two different categories. Your blog tends to cover place and setting, and your books cover people and characters. Does inspiration for a story usually strike when you come across a specific setting, or an historical figure? TG: Obviously, I see them as connected. 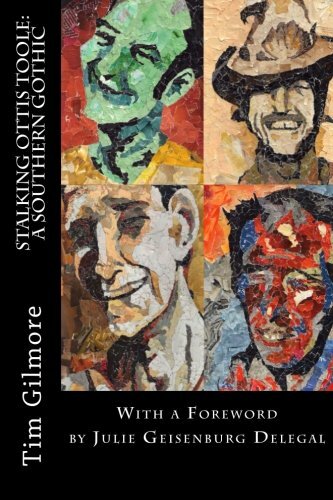 When I wrote about Ottis Toole, I wrote a lot about Springfield. When I wrote about Eartha White, I wrote a lot about LaVilla. And yet, it seems to me that if you’re writing something that’s a lot of pages and expect people to have some interest in it, it needs to be person-based. HW: Why is that? Does place become a little too ambiguous? TG: For 200 pages, maybe. I think some people would be interested in reading 200 pages about a neighborhood, but I think more people would be interested in reading however many pages about a strange, quirky little woman who, in some ways, inhabited Riverside, but you want to know her. And you get to know her neighborhood through her. You get to know her through her neighborhood. For something that’s in a longer form, you need to be able to connect on a human level. At the same time, I’m always trying to personify place. HW: How do you decide if a figure of local history is worthy of a book? TG: I always feel like they’re all worthy. HW: How do you decide if they’re worthy of you spending time writing about them? TG: There are several people who I’d like to write about. I think, ‘Who do I want to try to get to know?’ It doesn’t have to be a person I would actually like to know. I don’t want to hang around with Ottis Toole, but I definitely wanted to try to understand who he was. Anytime I write something longer that’s based on an individual, I feel, at some point, like I’ve gotten to know them. HW: In your work, you not only write about a person and their history – you explore the story of finding them. You put yourself and your process into your books alongside the story of the person. Do you feel like you get to know your subjects through that? TG: In a way, yes. In a way, no. I think a lot of this goes back to my mom. She died when I was 12. I had these vivid dreams after she died of wandering through different places—a forest, a zoo—looking for her, and never being able to find her. I feel like I’m always doing that. I have these dreams all the time about wandering through landscapes, and a lot of times, my legs will stop working. It seems like there has to be some kind of connection between that and why I write about dead people who I’m trying to get to know somehow. Bob Gray was the person I least got to know. I never really got a sense of who he was on the inside. It was just about how he manipulated his congregation and reached out to people, and his charisma, and how that connected to trends and politics and religion in the 20th century, and ultimately, how he used all of that for more than 50 years to exploit children. There was a bit of a different goal with that book. HW: Right. Maybe the goal with that book wasn’t so much to get to know him. You’ve written about many different types of figures of Northeast Florida history. You’ve written about good people—Eartha White, Ron Chamblin. 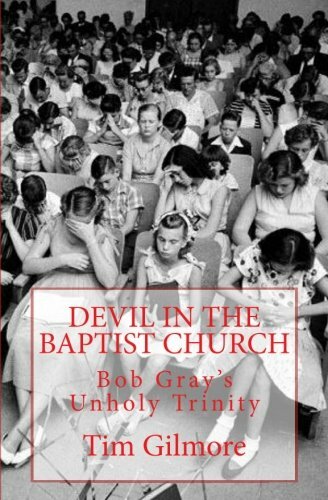 You’ve written about bad people—Ottis Toole, Bob Gray. You’ve written about weird people, like Virginia King. TG: Well, she’s one of the good ones. HW: Totally. But if there is an extra “weird” category thrown in there, she fits it. HW: What type of person engages you most of all in your work? TG: Maybe it’s the ones who are hardest to know. With Eartha White, I felt strange at first being this young white male writing this book about her. Then, I decided that what I was doing was trying to find her for my own needs. I can’t presume to know what it’s like to be black or a woman or a black woman who was born a few years after the Civil War. I also ended up feeling that if I needed her and reached out to her, she would not have turned me away. But, at the same time, she’s this huge figure. It’s almost like writing about someone mythological. I’m writing about this guy now named Rollians Christopher. This guy lived on what used to be Goat Island across from this little fishing village in Northern Duval County called New Berlin. The only way you could get to the island was by boat. He had no electricity. He had something like 1,100 goats. And he was probably illiterate. But suddenly, the Florida state government and the Duval County government wanted his island, to which he only had squatter rights. They ended up fighting over this guy who had no material possessions in the world almost, and these powerful governmental entities could not get him off his island. They finally did, and now it’s Blount Island. So I was dying to know about this guy. The more I find out about him, the more enigmatic he becomes. He very well may not be related to the Christopher family, which is perhaps the largest pioneer family in Duval County. No one is exactly sure where he came from. Everyone who knows him has contradictory stories about him. Apparently, he shot a fisherman in the face with buckshot and blinded him. People who grew up in the New Berlin area have stories. Like this guy named Fred who lived on Fred’s Island. His legs had been run over by a train when he was a kid, and he fashioned new legs out of car tires. You can’t tell exactly where the truth ends and the folk tale begins. There’s all these stories from out there, and Rollians Christopher is in the middle of them somehow. And it’s all elusive and I love it. It keeps pulling me back to it. HW: It seems that the most elusive characters captivate you most of all. TG: Yeah. Someone like Ottis Toole is fascinating because there’s so much more to him than just what the usual serial killer biographies say. He certainly didn’t kill 600 people. He certainly did not kill Adam Walsh. He at least killed one person by accident, and that was because he liked to set Springfield houses on fire. I think he learned that if he could tell tall-tales and shock people, then they would believe everything he said. He felt like a badass for the first time in his life. I think that is more interesting than the run-of-the-mill serial killer story. HW: In addition to your nonfiction work, you’ve written a great deal of poetry and short fiction. You have several books of poetry out, and the first book you published was a collection of poems. How do you decide what form fits a particular story? TG: I think everything that I write is infused with poetry to a certain extent. TG: And I like to blur boundaries. But for the most part, I feel like I am trying to chase down stories that do exist in the world already on their own, and then figure out what to do with them. HW: How do you figure it out, though? TG: You go to the place. You find out about the people. You let yourself try and absorb the place somehow. You think about how that time has disappeared, and it’s ultimately unknowable. Yet, you try to feel this unknowable thing at the same time. HW: In the conversations you and I have had, you’ve expressed feeling at odds about many of your readers considering you a “Florida writer.” But to me, and to many others, you epitomize this term. You’re a Floridian writing in and about Florida. Can you explain your ambivalence toward this label? TG: I don’t want to be pigeonholed. I don’t want the only reason why you’d read my work to be an interest in Florida. James Joyce always wrote about Dublin, but you wouldn’t just call him a Dublin writer. You could call him an Irish writer, but primarily, you’d call him a great writer. I don’t presume to be a great writer, but I would like people to think I am. HW: Do you think calling yourself a Florida writer, or having other people call you this, would work against calling you a great writer? TG: It’s interesting. If people want to call me a Florida writer, they can, obviously. I’m not going to send them a cease and desist letter or anything. But if you go to the bookstore, and you’re looking for James Baldwin or Toni Morrison’s books, are they in the literature section? Are they in the black section? The black literature section? Maybe they should be in all of them. If they’re in the black literature section, do you go there anytime you’re looking for black writers? Does being black somehow subcategorize them from all the rest of literature? Ultimately, if people are reading me and calling me a Florida writer, that’s okay. I guess it’s more of a way of my thinking about myself. I want what I’m doing to be interesting to someone living anywhere else in the world, not just people who have an interest in learning more about Jacksonville. HW: In addition to your body of work as a writer, you’re also a pretty terrific professor, father, husband, and friend. I don’t understand how you find the time and patience to do all of these wonderful things in addition to being an overwhelmingly caring literary citizen. TG: You’re just embarrassing me. HW: (laughs) Well, you write a column called Let There Be Lit, in which you share your appreciation for Jacksonville writers. 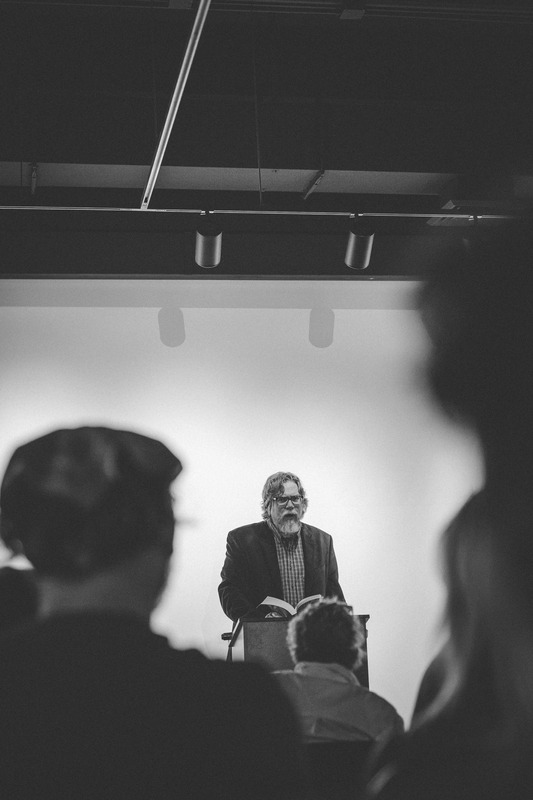 You host an annual literary festival, Jax by Jax, in addition to a monthly reading series. What fuels your passion and compassion toward Jacksonville’s literary community? TG: I mean, it’s not selfless. I want to know good writers. I want them to know that I like their work. I want to live in the kind of town that has stuff like that. You know what I mean? A town that has literary events. It’s like when you feel, “Oh, if such-and-such story every existed, I would love to read that.” And so you have to write it, because you’re the only one who has thought that that story should exist. TG: Yeah. And at the same time, there are so many writers in the world. I feel like if I want people to read me, I need to read other people. If I want people to support me, I need to support other people. That’s why I’m saying it’s not selfless. Mark Ari [a Jacksonville writer and educator] has influenced so many people, and he’s set up several reading events for me at UNF. I wonder how to thank somebody for that adequately. It’s the best I can do. HW: You’ve written, what is it, fourteen books now? TG: (thinks for a moment) Yeah. HW: How have you done that? How do you have the energy to do that? You just keep going. TG: I’m obsessive. And you mentioned that I write the investigation into the story. I don’t do a bunch of research and then write. I research and write at the same time, so it’s constantly a back-and-forth. When I find things out, I’m still excited about them, and I want to write them down. They’re fresh that way, I hope. I want it to feel like the reader is involved in the investigation. I guess the traditional way to do this is to research for however long that takes, and then after that research period, start writing. But I like to do it all at the same time. If I did a year or two of research, I don’t know how I could be as excited about the first things I’d found out. Also, I feel like I have a sense of urgency. Since my mom died when I was young, I’ve always felt like I have more of a sense of mortality than a lot of young people. I always think about what I’m going to leave behind. I want to be read now, but I also want to be read after I’m not here anymore. Maybe it’s morbid, but I think about that constantly. HW: Do you feel that leaving behind a huge body of work will increase your chances of being remembered in, like, a hundred years? TG: (laughs) I think so! I’ll leave more stones behind—more breadcrumbs for people to follow my trail. When you’re finding out about one story in your research, you find out about all of these other side-stories. You can try and include all of them, and then the whole thing is bulky and shapeless. Or, you can say, “I have to carve this one out, but it still exists over there.” So when you have the time, you have all these other stories that you wanted to know more about. There’s always so much more. HW: Right. How could you stop at this point? TG: It’s kind of scary. HW: Last question, and I’m really excited to hear the answer to this one. HW: You’ve taken on an activist voice in your writing as of late. You recently presented a series on the KKK’s activity in Jacksonville. Where does your role as an activist come from? TG: I think it’s always been there, to a certain extent. I think of myself as a writer more than anything else. I’ve always felt strongly about things. Recently, after the protesters were beaten up by the police in Hemming Park, I wrote a Jax Psycho Geo story on Hemming Park. I’d already written some stuff like that, though, several years before. But that happened, and the Sheriff released his statement, and the first word was, “Historically…” I thought, Wow! The gall! This happened right behind the marker for Axe Handle Saturday. And Axe Handle Saturday is only the thing most people know about. There’s so much more. When it comes down to it, I think what we think about the world, our place in the world, our politics—it’s all a story. There are a lot of people in the South who want that story to be cleaned up and whitewashed. To say that the Confederacy was just about states’ rights, and black people fought for the Confederacy, and nonsense like that—I feel that if the South is ever going to be the best South it can be, it has to own up, take responsibility, and tell the truth. Only once you do that do you figure out how to be better. I want it to be the best place it can be.